CYBER ITALIAN: LEARN ITALIAN ON-LINE! Cyber Italian Online Italian lessons with native teacher. Learn online at your convenience. Beginner to advanced students. CyberItalian offers varying types of instruction: Self-Study Courses, Tutored Courses, Private Lessons & Italian Coaching Programs. with Italian history and cultural lessons songs and interesting insights about the country which I enjoyed and was a real plus for me! I chose to work with a tutor and she gave me the opportunity to have more personal interaction and the opportunity to speak with her personally in on-line chat sessions. 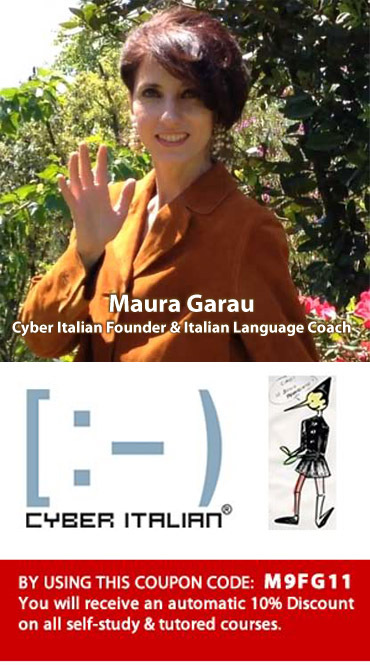 In 2013 I studied directly with the director of Cyber Italian – Maura Garau. I participated in one of Cyber Italians Italian Coaching Programs: “Life the Italian Way”. In this particular Italian seminar through watching and the analysis of famous Italian movies together with Maura I explored Italian daily life-style and how the values of Italian tradition help us to understand modern Italian life. Maura sends you all the films, you watch, write about them and discuss them with Maura via Skype sessions. Watch this video filmed in the Villa Borghese and meet Maura Garau – Cyber Italian Founder and ItalianLanguage Coach. Use Code M9FG11 to receive 10% Discount!